Brooks PureConnect | Run Inspired. In addition to my compression socks I bought this weekend, I also bought a new pair of shoes. Originally when I went into the store, I was planning on buying another pair of New Balance Minimus. However, I had been considering a minimalist shoe with just a little more cushion. I decided to buy the Brooks PureConnect on a whim (again, it was tax free weekend and I had a coupon), and so far so good. I’m not going to go into a detailed shoe review. Sometimes I find that to be a little too technical and overwhemling. Instead, I just want to give a little background on the Brooks PureProject and give my overall thoughts of the shoe. The PureProject collection is a tribute to runners with a sense of adventure and a craving to grab their run by the horns. Radically lightweight, flexible materials merge with smart design to naturally align your stride and empower every push-off. Unleash your feet; experience the PureProject by Brooks with four unique shoes in vibrant colors. There are four shoes that make up the PureProject. They are the PureConnect, the PureFlow, the PureCadence, and the PureGrit. PureConnect is the lightest, and most flexible shoe. PureFlow has a little more cushion but still with the lightweight, free feel. PureCadence has more stability and a “reinforced heel that cradles the foot.” Finally, the PureGrit is more suited for the trails and it was created with the help of Scott Jurek himself. I went for a recovery run Sunday after my long run on Saturday. Saturday’s run was tough – hilly and super humid. (So humid I actually weighed my clothes once I got home and wasn’t too surprised when the scale said 2.4 pounds. ) For my recovery run, I wanted to go easy and I didn’t have high expectations. I put on my PureConnects and headed out the door. I went out focusing on effort – go easy and do NOT injure yourself. My initial thoughts – oh my this shoe is amazing! It is super light which is what I’m use to, but it has just the right amount of cushion. Exactly what I was looking for. 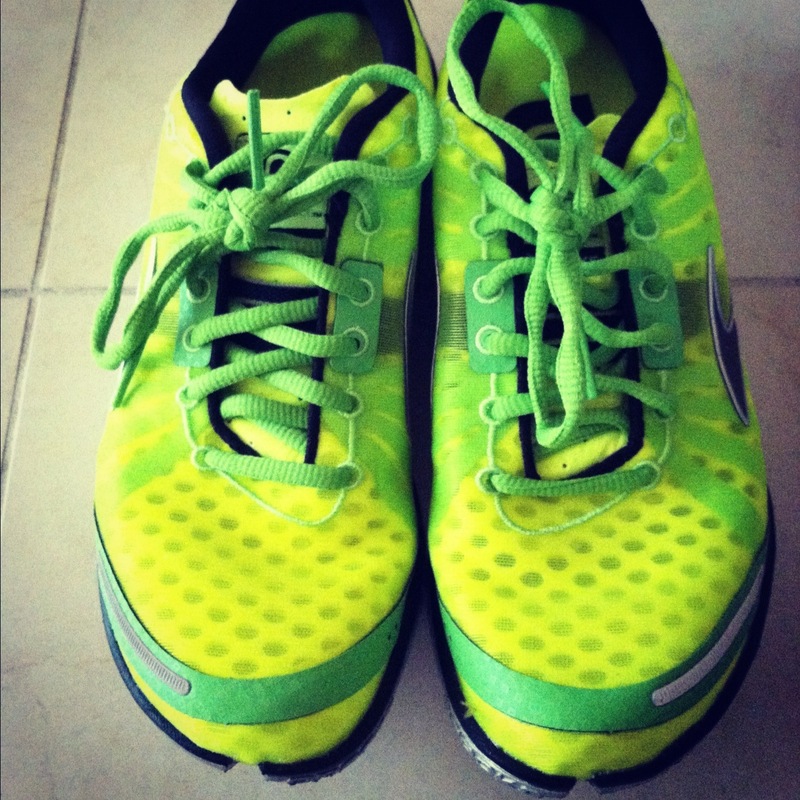 Sometimes my feet need a break from pounding the pavement in the Minimus and this shoe was perfect. It is extremely breathable and it fits my foot like a glove. I don’t like for shoes to be too loose. I prefer the snug feeling and this shoe has it. This morning I went out for an 8 miler and wore the PureConnects again. My initial thoughts were reaffirmed – minimal, breathable, and just a little cushion. If you want to read all the specs of the shoe, go here. Right now I have 11 miles on the shoes. Therefore I can’t comment on the durability and my mind might change about the awesomeness of the shoes in a few weeks. Only time and mileage will tell. But I appreciate what Brooks is doing with the PureProject, and I look forward to running in the PureConnects while here in Miami. The nice flat roads will certainly be a change from Raleigh. Sounds you are getting the most out of tax free shopping! Enjoy! I’ve heard good things about the Brooks and may give them a shot in future also. I currently run in 2 different pair of Inov-8s, as well as a pair of Reebok RealFlex when I need to give my feet a slight break from the minimalist theme. When the time comes to swap out the Reeboks (or just add to the collection) I might give the Brooks a try. Hope you have fun in Miami. I lived there for 15+ years and studied at Univ of Miami. I’ll be back in January for the 1/2 marathon. Nice!! I thought about buying two pairs as well but decided tax free didn’t quite justify all the shopping 😉 I’m glad you’re loving your shoes and aren’t the colors fabulous? I love my neon shoes! I’ve been doing my trail running with the PureGrit. They are the only Brooks I’ve owned and been happy with them for trail performance as far as comfort, traction, and being able to feel the terrain. I’ve been a Mizuno fan for years and still am for pavement (Wave Universe for minimal and Wave Creation for cushion) but they don’t seem to have a neutral trail shoe to suit me. I’m glad the PureGrit are working out for you. Are you doing your trail runs in Raleigh? I’m curious to know where you run. Do you ever go out to the American Tobacco Trail? It’s good to hear from you and I hope all is well!!! I’m doing great and hope ya’ll are. I usually trail run at Lake Johnson. I think the unpaved part on the Cary side of the lake is about two miles and then I run the trail that follows the shoreline around the I-40 side of the lake (it is probably another mile or so). I like umsteads trails too but don’t make it out there as much. I’ve biked the American Tobacco trail from end to end a couple times but never ran it. I like a little elevation change and the ATT is so flat it seems like it is uphill both ways to me. Thanks for keeping up the blog. Your lessons and experiences have motivated me to keep running. I’m doing great. Hope you all are! For convenience I usually run the unpaved trails at Lake Johnson. I think it is around 3 miles if you take the backside of the lake and the shoreline trail on the I-40 side. Umstead trails are good too but less convenient for me. I have ridden my bike on the American Tobacco Trail from end to end a couple times but haven’t ran it. I like a little elevation change and the ATT is so flat it seems uphill both ways to me. Just got my pureconnects in the mail. I can’t wait to run in them! Since my ankle was bothering me, I decided my saucony cortanas were just too heavy. I hope the connects are the answer to my prayers!